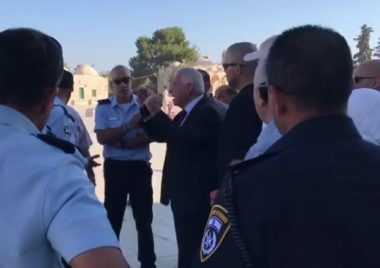 On Tuesday, Israeli soldiers and police officers, abducted six Palestinians, including three from the courtyards of the Al-Aqsa Mosque, in occupied East Jerusalem. The Palestinian Prisoners’ Society “PPS” has reported that dozens of soldiers invaded Silwan and at-Tour towns, searched many homes and abducted three Palestinians. The PPS said the abducted Palestinians are Mohammad Abu Ghannam, 16, Adnan Rajabi, 16, and Mahdi Jaber, 20. The soldiers interrogated the Palestinians and several members of their families, before abducting them. Furthermore, the soldiers abducted Anas Dabbagh and Ali Bkearat, from the courtyards of the Al-Aqsa Mosque. The two, who work for the Waqf and Islamic Endowment department, were released later, the PPS said. Also in Al-Aqsa, the soldiers abducted Mohammad al-Hammouri, and summoned Emad Abdeen for interrogation. It is worth mentioning that Abdeen is a firefighter, working for the Waqf Department in Al-Aqsa. Furthermore, the soldiers invaded the family home of Lawyer, and former political prisoner, Shirin al-‘Isawi, in al-‘Isawiya town, in Jerusalem. In Bethlehem, several army jeeps invaded Nahhalin town, and fired many gas bombs and concussion grenades.